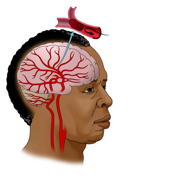 A stroke occurs when blood flow to an area of the brain is cut off. There are two main types of stroke: ischemic (is-KEM-ik) and intracerebral hemorrhage (HEM-er-rij). ​What is it? Ischemic stroke is the most common kind of stroke, accounting for about 85% of all strokes. What causes it? This type of stroke occurs when an artery is deprived of oxygen by a blockage, such as a blood clot. Without oxygen, brain cells die within minutes. These clots can be caused by several different kinds of diseases. The most common is narrowing of the blood vessels in the neck or head. What is it? A hemorrhagic stroke is less common, accounts for 15% of strokes, but is responsible for about 40% of all stroke deaths. 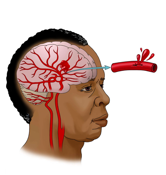 It occurs when an artery bursts, allowing blood to leak inside the brain. The sudden increase in pressure within the brain can cause damage to the brain cells surrounding the blood. What causes it? There are two types of hemorrhagic stroke: intracerebral and subarachnoid hemorrhage. A common cause of intracerebral hemorrhage is high blood pressure (hypertension). Less common causes of intracerebral hemorrhage include trauma, infections, tumors, blood not clotting properly, and problems in blood vessels.